Built in 1941, by Robert Jacob Shipyard of City Island, New York (hull #YTL 159) as the YTL-159 for the United States Navy. The United States Navy later redesignated the tug as the YTL-159. In 1947, she was acquired by the Foss Launch and Tug Company of Tacoma, Washington. Where she was renamed as the Chris Foss. She was later sold. Where the tug was renamed as the Gold Stack. 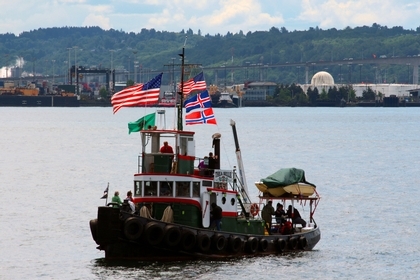 In 1997, the tug was acquired by Tuuli Messer of Port Richmond, California. Where she was renamed as the Benjamin. The tug was later sold, where she was renamed as the Coral. Then as the Sturdy, and then as the Belle. In 2007, she was acquired by James Bennett of Port Orchard, Washington. Where she was renamed as the Thea Belle. And, was converted for use as a yacht. She is a single screw tug, rated at 240 horsepower. Hailing Port: PORT ORCHARD, WA.